₋ First, you have to issue Principle License (Izin Prinsip or IP) at BKPM One Stop Service - Center or OSS-C (Pusat Pelayanan Terpadu Satu Pintu or PTSP Pusat). ₋ When you want to invest in Indonesia, first you have to check whether your business is open for FDI in Indonesia in accordance to the Indonesia Investment Guidance (Daftar Negatif Investasi or DNI) under the Presidential Decree No. 44 of 2016 that stipulates the sectors which are closed and open with conditions to investment. If the business sector is not listed in the DNI, the business will be considered open and allowed for up to 100% foreign ownership. If the business sector is open or open with condition, the foreign investor will be able to apply for Principle License (IP), to begin the investment process, subject to the condition stated in Indonesia Investment Guidance (DNI). ₋ All application for Principle License (IP) will be done through BKPM-Online Service Platform or Electronic Investment Information & License Service (SPIPISE) [http://online-spipise.bkpm.go.id]. All investor will always be able to approach BKPM office for advice and assistance in the aplication process. ₋ Once the Principle License (IP) is approved by BKPM OSS-C, investor will be able to setup its business entity by engaging any public notary office to draft the establishment of FDI Company (PT.PMA), which is called Company Deed of Establishment. This draft will need to be ratified by Ministry of Justice and Human Rights of the Republic of Indonesia to be legalized and officially posted in the state gazette. ₋ After that you are able to establish the legal entity of your company in Indonesia by engaging a public notary to issue a Deed of Establishment. The Deed of Establishment of FDI Company (PT. PMA) could be issued by public notary in Indonesia and it is prepared in Bahasa Indonesia. Line of business of the company. The composition of the Board of Directors or BOD (Dewan Direksi) and the Board of Commissioners or BOC (Dewan Komisaris) of the company. The identity of the company shareholders and the share of ownership. ₋ The legal entity of the FDI Company should be a Limited Liability Company or Ltd. (Perseroan Terbatas or PT). The ‘PT’ company should be owned by minimum 2 parties; each party is either individual or corporate. According to Indonesian law, any company with any percentage of foreign shareholding is considered as a FDI Company or foreign-owned-PT-company, in short ‘PT. PMA’. ₋ After the establishment of the legal entity, the public notary will register the new PT. PMA to the Ministry of Justice and Human Rights of the Republic of Indonesia. Once registered, the establishment of new PT. PMA will be published in the state gazette. ₋ The ratification of legal entity by the Ministry of Justice and Human Rights of the Republic of Indonesia will serve as the basis of establishment of PT. PMA. From this point, the PT. PMA will be able to start setting-up the company infrastructure and related operational licenses. Before establishing the PT. PMA, you should check the availability of the company name that you want to set up from the Ministry of Law and Human Rights of the Republic of Indonesia through public notary in Indonesia. With respect to applications of any licences from BKPM or other government institutions in Indonesia, all information on the application has to refer to the Deed of Establishment of PT. PMA. Any changes of company condition which is not relevant with the Deed of Establishment, such as change or expansion of business sector, change of company location or business activity location, should be informed to the BKPM and related government agencies to get licenses amendments. 1. Taxpayer Identification Number or Tax ID (Nomor Pokok Wajib Pajak or NPWP), can be applied through online service of Indonesia Directorate General of Taxes at https://ereg.pajak.go.id (currently the service is only available in Bahasa Indonesia). Regional licenses, such as Company Domicile Certificate (Surat Keterangan Domisili Perusahaan or SKDP), Environmental License, Building Permit (Izin Mendirikan Bangunan or IMB), Nuisance Ordinance Permit, and Location Permit can be obtained from the local or regional authority where the PT. PMA is located and applicable through the office of building management or industrial estate management. General Importer Identification Number (Angka Pengenal Importir Umum or API-U) or Producer Importer Identification Number (Angka Pengenal Importir Produsen or API-P) is applicable through BKPM OSS-C.
Foreign Worker Employment Permit (IMTA) is applicable by online to the Ministry of Manpower through link http://tka-online.naker.go.id. Other technical licenses, investor with legal business entity will be able to processing all the required licenses from technical ministries through One Stop Service center at BKPM. High officials from 22 technical ministries and government agencies will be positioned in BKPM to attend to all investment inquiries and also application of the technical licenses pertaining to their business sector. ₋ Once the company is ready for Commercial Stage, FDI Company will be able to apply for its Business License (IU) from BKPM OSS-C to start its business operation. 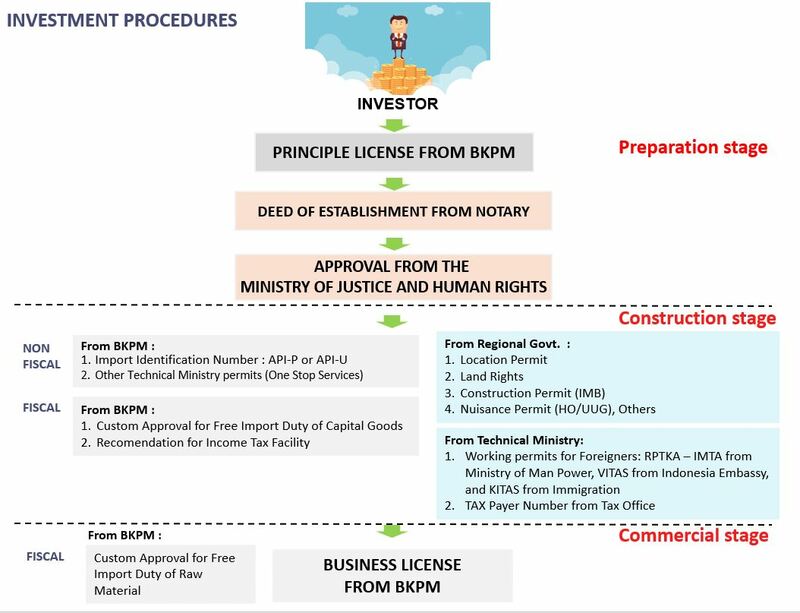 All foreign investors who setup business entities are mandatory to submit Investment Activity Report (Laporan Kegiatan Penanaman Modal or LKPM) periodically to BKPM. The FDI Company will be need to update the LKPM every quarterly during its setting-up period (after owning Principle License or IP) and biannually after receiving its operational (after owning Business License or IU).